There is a portrait over my left shoulder as I sit here and write in my study. 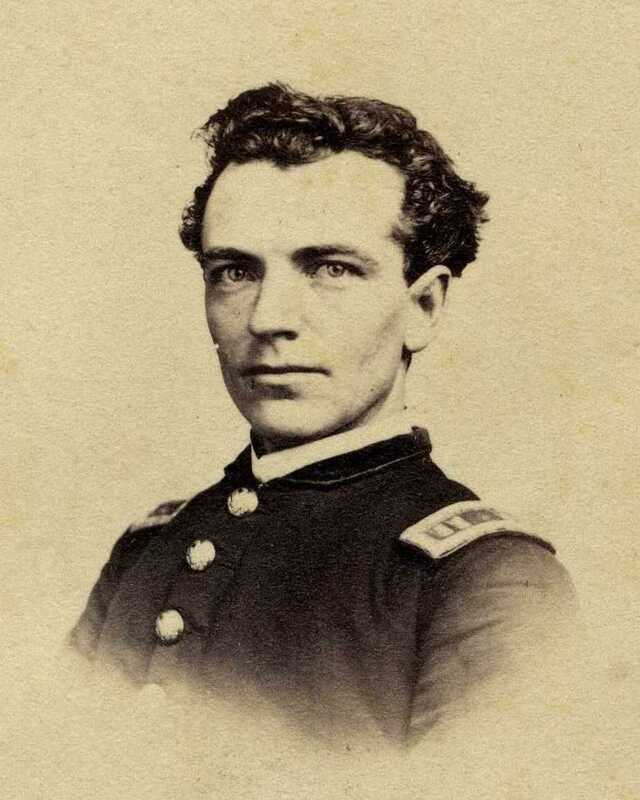 Captain John F. Dunning of the 22nd Massachusetts Volunteer Infantry. By virtue of several random twists and turns of fate, I happen to have a connection to this man. 150 years ago, John Dunning signed up as a lieutenant in the 4th Massachusetts Volunteer Militia on January 24, 1861 in Boston. The Civil War had not yet begun, but preparations were being made on both sides. In the ten days between January 9 and January 19, four states joined South Carolina in voting for secession. More would soon follow. Things were quickly falling apart. In Massachusetts, Gov. John Andrew, perhaps the most pro-active of all Civil War era governors, ordered the readiness of the four standing regiments of peacetime militia. The individual companies comprising these units began to energetically drill and recruit…thus the timing of Dunning’s enlistment. One has to respect these militiamen who answered the call before the call had even officially gone out. John Dunning was 28 years old at the time. He was born in the tiny farming and mining town of Brownville, Maine, about 45 miles north of Bangor. He worked as a carpenter. In 1856 he married his wife, Marie, and in 1857 they had a son, John. In 1859, Dunning made the peculiar decision to move to Boston leaving his wife and two year old son in Maine. We can only guess at his motivations. Probably, there was too little work for a carpenter in rural Maine and he intended to better support his family by working for a year or so in Boston without uprooting them. On the other hand, it could be there was a problem. There really is no way of knowing why he made the move alone, but I think it is telling of Dunning’s character that he gravitated towards New England’s metropolis. I get the sense that he needed something more out of life than the hills of Maine could offer. By 1860, Dunning was a master carpenter earning a decent wage and living in a boarding house in the Boston neighborhood now known as Chinatown…it was then, however, predominantly an Irish neighborhood. It is not surprising that Dunning was attracted to the militia. His father, John A. Dunning, had served as a colonel during the War of 1812. Dunning apparently intended to follow his father’s example. Shortly after signing up, Lt. Dunning was transferred to Company K of the 6th Massachusetts Militia. After drilling in Boston through the winter, Company K received the call to war on the evening of April 15, 1861. Fort Sumter had been fired upon just days earlier and Lincoln had called for volunteer troops to defend Washington. Upon receiving the news, the men of Company K gave three cheers, then prepared to depart. Gathering that night with the other companies of the regiment at Faneuil Hall, they left by rail on April 16 after ceremonies in front of the State House attended by excited thousands. As their train approached Baltimore, the officers and soldiers of the 6th Mass prepared for trouble. Maryland remained in the Union, but the spirit of secessionism was nonetheless strong. As there was no direct rail through Baltimore, the regiment’s train would have to stop at President Street Station on the east side of the city. It would then be uncoupled and each car pulled by horse teams along Pratt Street to Washington Station on the west side of the city. A huge secessionist mob in Baltimore, however, had no intention of allowing the soldiers through. The 6th arrived in Baltimore a few hours early and actually caught the secessionists unaware. Some of the railroad cars did make it through relatively unscathed. Dunning’s Company K was aboard one of these cars. The mob gathered quickly, however, and Dunning’s company was subjected to a barrage of bricks, clubs and bullets as they hunkered down in the rail car. Four companies of the regiment were not so lucky. The mob quickly built obstructions across Pratt Street, including one formidable barricade with a cannon and the companies in the rear were required to debark from their cars and force their way on foot through the maelstrom of Pratt Street. Four soldiers were killed and 36 wounded. Twelve civilians were killed and an unknown but likely significant number were wounded. The fatalities during the Pratt Street riot are often referred to as the first of the Civil War (no one was killed in the Battle of Fort Sumter). Aside from the momentous episode in Baltimore, the 6th Mass served a fairly uneventful term of 90 days and returned to Boston on August 1, 1861. Dunning, however, was not finished with the war. Volunteer regiments were now being called up for a term of three years and Dunning intended to raise his own company. He opened a recruiting office in the basement of the Boston Museum, a landmark theater and gallery of art and curiosities near King’s Chapel. In nine days, he had already recruited half of his company. He called it the “Everett Guards” after former Massachusetts governor and U.S. senator, Edward Everett. On October 1, 1861, the Everett Guards became Company D of the 22nd Massachusetts and Dunning received a commission as captain. It was said that, as the 22nd left for war, Dunning was fond of making a certain toast, “Here’s to a yellow sash or six feet of Virginia soil.” Meaning he intended to make the rank of general or die trying. The 22nd Massachusetts saw its first action during the Peninsular Campaign in the spring of 1862. The campaign represented an attempt by Gen. George McClellan to take Richmond by the shortest route possible, landing his Army of the Potomac on the Virginia Peninsula at Hampton Roads. Good idea in theory but dreadful in execution. McClellan was characteristically slow, allowing the Confederate army time to mass in Richmond and eventually batter the Army of the Potomac into retreat during the Seven Days Battles. On the third day of this action, June 27, 1862, as the Union army took up a defensive position around Gaines’ Mill, Virginia, the 22nd Mass found itself in a bad spot. With the Confederates advancing and other Union brigades rapidly falling back, the 22nd was almost surrounded. Colonel Jesse Gove, commanding the 22nd, made the wise decision to about face his regiment and march them to the rear. But then, for reasons unknown, he changed his mind. Perhaps he saw some tactical advantage and hoped that a stand by the 22nd might break the Confederate advance. Perhaps he simply loathed the idea of a retreat. Either way his decision was disastrous. The 22nd halted, turned to face the enemy and was utterly overrun. Colonel Gove was killed in the action. Roughly half of his regiment was killed, wounded or captured. 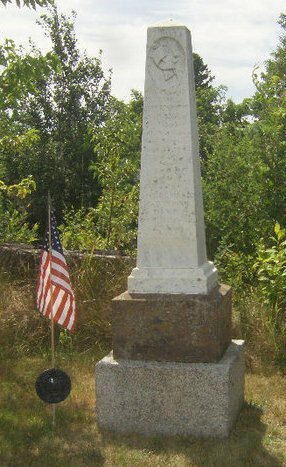 Among the dead was Captain John F. Dunning. Today, a new incarnation of Dunning’s company exists in the form of a group of reenactors. As captain of the reenactor version of the 22nd Massachusetts, Company D, I find myself representing Dunning, in a way, and I am honored to do so. Oddly enough, members of the company have indicated that I bear a considerable resemblance to him. I can see it, though I can only wish for his head of hair. Last summer, some of the 22nd Mass made the trip to Brownville, Maine to pay our respects to Captain Dunning. We were warmly welcomed by the Brownville Historical Society. We marched from their building to the cemetery and fired a salute at Dunning’s grave. It was quite an experience to finally see his resting place and a bit overwhelming to consider the manner in which his leadership and courage are still producing echoes in the 21st century.